Blond Hambition indeed! If this isn't an hautrageous dog costume for your little show-off, I don't know what is! Gold cone bosom holders top off the diva's glamorous gold dog vest, and,well, the blond wig and mike... can you beat this for a female dog costume? No, it's not Halloween yet, but you wouldn't know it; this brand new 2012 costume has already sold out in all sizes! 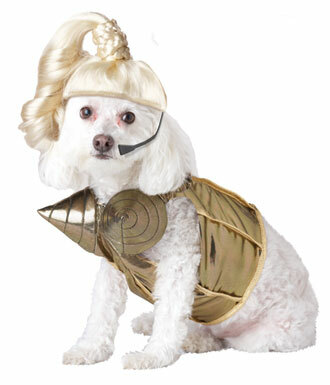 Don't worry, the Blond Hambition Pet Costume is coming back in and you can pre-order it now at Costume Kingdom.